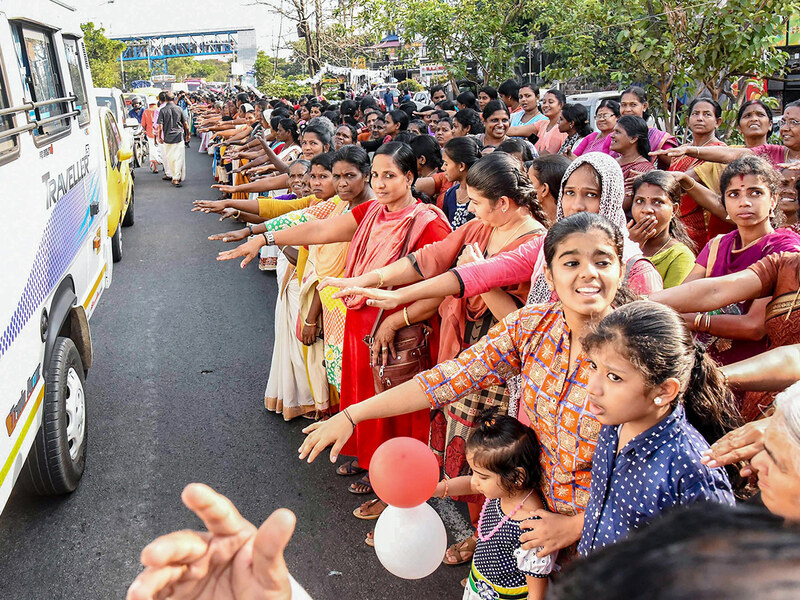 Thiruvananthapuram: Kerala began 2019 with high hopes that frequent shutdowns called ‘hartals’ will be given a goodbye in the New Year, but many parts of the state ironically witnessed traffic snarls and business disruptions as crowds gathered for constructing a symbolic wall on New Year’s day. At least a million women were expected to participate in creating a symbolic wall from Kasaragod district in the north of the state to Thiruvananthapuram in the south. 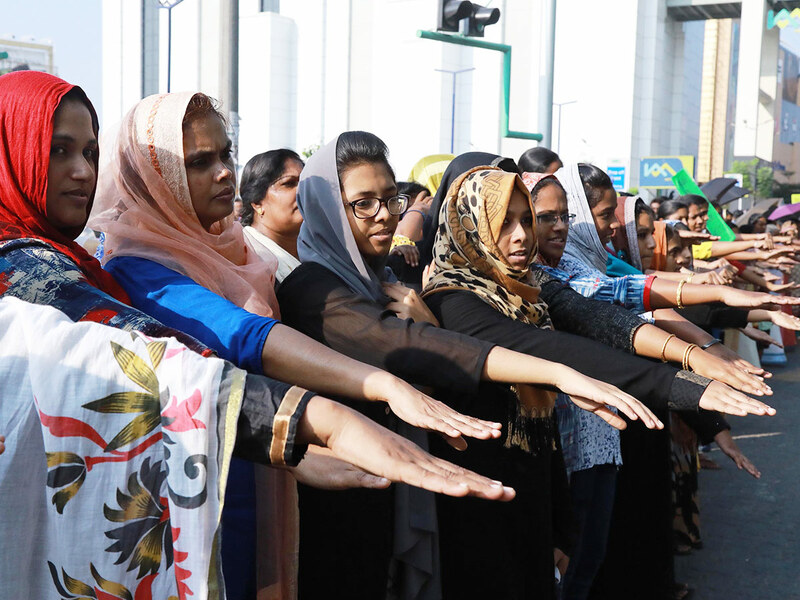 The women began gathering at pre-planned locations along highways by Tuesday afternoon, and several educational institutions either postponed examinations scheduled for the day or slashed class hours on Tuesday to help students escape the traffic hold-up. The women’s wall is an initiative backed by the ruling Communist Party of India Marxist, and is purportedly to trigger renaissance values and rational thinking among the people. The effort is in the context of India’s Supreme Court ruling in September last year permitting girls and women of all ages to enter the Sabarimala temple which has traditionally been a male preserve. No woman in the fertile age, however, has been able to make the trek up to the temple despite the court verdict owing to protests by devotees of Ayyappa, the temple deity. The protests are backed by the Bharatiya Janata Party. Supporters of the wall, which will span the 620-km north-south stretch of the state, expect between 1 million and 5 million to join hands in forming the symbolic wall. The wall idea has seemingly divided the state with Kerala’s numerous political parties and religious and community organisations taking postures for or against the wall. The Nair Service Society (NSS) which represents the prominent Nair community in the state has criticised CPM’s idea of erecting a women’s wall, while the Bharat Dharma Jana Sena which claims a majority of Ezhavas in its fold has thrown its weight behind the wall. “After the women’s wall, Kerala which is known as God’s own country will become devil’s country”, said NSS general secretary, Sukumaran Nair. On the political front, the Opposition Congress party has disapproved of the idea, prompting the CPM to allege that the Congress is helping the BJP cause. The row over the women’s wall is ironic, considering that the people of Kerala who presented a united front in the face of devastating floods in August are now pulling in opposing directions over a court verdict to ensure gender justice at a temple. The wall has also raised doubts about whether the state will finally end the hartal culture, because the first event in the state in 2019 itself involved partial shutdown during the day in many places. 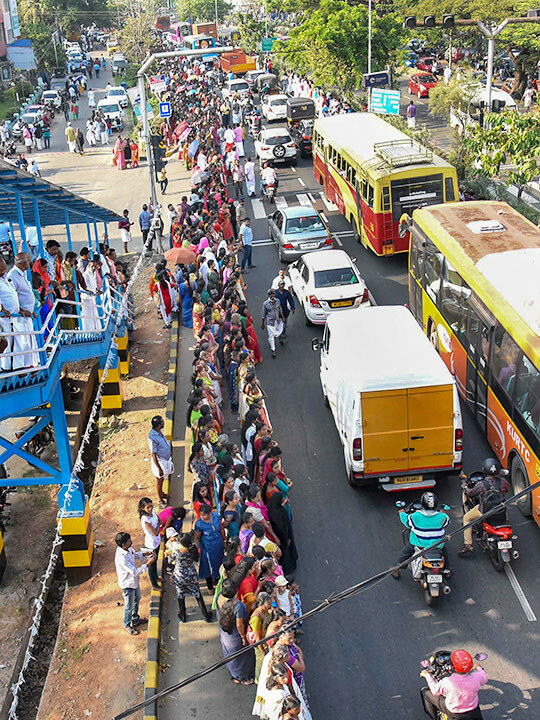 Educational institutions in several districts including Pathanamthitta, Idukki, Kottayam, Kozhikode, Kannur and Kasaragod declared a holiday to ease the traffic blockade expected because of the women’s wall formation.